I have been fortunate to experience many outstanding restaurants throughout the world in my travels. My dinner at Castle Bled Restaurant may take the award for the most fantastic view. Perched atop a rocky outcrop 130 meters above glacial Lake Bled in Slovenia, Castle Bled is the oldest medieval castle in Slovenia. Panoramic views of the lake, the small island with its iconic church, and the surrounding Karawank Mountains set the mood for fantastic food and wines. It was a wonderful venue to enjoy dinner with my son, a US military officer stationed in Italy. Menu: On this June evening, Castle Bled Restaurant featured a set menu with two options for each of the five courses served throughout the night. Even though it was a limited menu, the Chef’s Tasting Meny worked out great for us. Our waiter was extremely professional, friendly, and accommodating, and added to a very positive dining experience. My son gave rave reviews for the flavorful trout filet with buckwheat and fennel, celery, and pear cream with parsley root. For my main course, I ordered the piglet with baby corn mousse with a side of fried polenta and salsa, which was also outstanding. Serving sizes were just right, and I was pleasantly full, but not overstuffed. Other tasty dishes included the spinach tagliatelle and thin slices of aged beef served with pear, goat cheese, and baby lettuce. Creative and delicious desserts like the chocolate mousse with mint, almond crumble, raspberry ice cream, and kisses were fantastic. Another outstanding dessert was white chocolate and yogurt mousse with forest fruits, buckwheat crumble, and meringue. 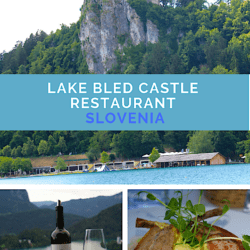 Thoughts: Lunch or dinner at Castle Bled is truly a once in a lifetime opportunity. I was very excited about dining here, and will always remember it as one of the highlights of my time in Slovenia. One of the most visited sights in Slovenia, over 300,000 visitors come to see the historical and cultural attractions of Lake Bled. While I was visiting my son in Italy, we decided to make a short trip to Slovenia and have dinner at the castle. To make this fairytale experience come true, reservations are highly recommended. If you don’t have reservations, you might be lucky and get a table if there are any free at the time of your arrival. But don’t take any chances – make those reservations! In addition to the full-service restaurant, Castle Coffeehouse is available in the lower courtyard, where guests can also enjoy an unforgettable view of the island and the lake below. The coffee shop offers premium Slovenian wines, craft beers, coffee, or a slice of Bled’s famous cream cake. In addition, a small boutique store called Castle Beehouse on the grounds of Castle Bled offers honey products and souvenirs from Slovenia. To get to the castle, take a 15-minute walk from town up the scenic route. Or, if you would rather drive, it’s a quick trip from town with plenty of parking at the top of the cliff. I was curious about the view we would have once we were seated. After parking, we walked up the winding path, crossed the drawbridge over the moat, and entered the courtyard. Passing by the blacksmith shop and the museum, we spied many diners seated indoors as we climbed the stairs to the outdoor seating area. Our waiter brought us to our table on the edge of the terrace. What a view! On the outer edge of the terrace, I felt like we were floating above the glimmering lake, with Bled Island and its iconic church and the Karawank Mountains adding to the kaleidoscope of colors and textures. I could have sat there for hours with no food, no wine, and no conversation, and had a wonderful time. However, add in some fantastic food, fabulous wine, and the company of family, and you have the ingredients for a truly memorable experience. If I return to Bled, you can be sure I will make arrangements to dine at the magical Castle Bled Restaurant again. Price: 50 Euro for the Chef’s Tasting Menu (Appetizer, and choice of two options for five courses, including desserts); wines range from 30 – 100 Euros per bottle. Disclosure: The author was treated to a complimentary meal at Castle Bled Restaurant.